Most of our rounding methods are based on arithmetic rounding. We look at the „middle“ between two allowed numbers, for example usually something like when rounding a number between and to integers and automatically assume that above that middle we round up, below we round down and exactly on the boundary we need additional rules. This middle is the arithmetic mean of the two neighboring allowed numbers after rounding and hence we can call this arithmetic rounding. All numbers with are rounded to two, all numbers with are rounded to three. We assume and , so each real number should be rounded to an integral number. Also we assume . harmonic-geometric mean (also called geometric-harmonic mean): Can be defined in a similar way, by just replacing the artihmetic mean by the harmonic mean. contraharmonic mean is not so hard to understand, find it in Wikipedia. logarithmic mean is not so hard to understand, find it also in Wikipedia. We could also define a arithmetic-harmonic mean in a similar way, but that is just the geometric mean. It is an interesting way to approach the geometric mean of matrices, which is somewhat hard to define otherwise because of the non-commutative multiplication. For the users of spreadsheets, like included in LibreOffice, OpenOffice or MS-Office, you can find the arithmetic mean as function average, the geometric mean as geomean and the harmonic mean as harmean. The line from K to L has the harmonic mean of and as a length. The geometric mean would be reached by moving that line to a position that the upper and lower part have the same shape, apart from scaling. 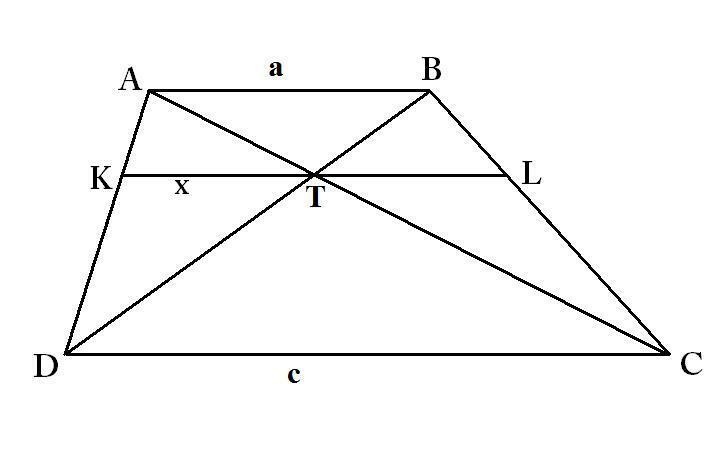 And the arithmetic mean would be reached by moving K and L to the middle points of the lines AD and BC, respectively. The ruby-gem long-decimal supports all of these methods for calculating a mean. Just to give you an idea that you can extend this further, the geometric and harmonic mean are now considered. The obvious assumption of rounding to releaves us from dealing with logarithms of zero or division by zero. We would see that anyway any number between and would be rounded to for both harmonic and geometric rounding, because the boundary is 0, if we pick the right variant of the formula for calculating the mean. Also between and everything is rounded to in our example. Otherwise the calculation of the boundary can be made to work, because then both factors are negative, so we draw the square root of a positive product, but then we need to replace the square root by its negative counterpart. Quadratic and Cubic rounding can be defined in a similar way. It would even be possible to go for arithmetic-geometric rounding or harmonic-geometric rounding, but that would imply having to do an approximative iterative calculation of the boundary each time it is needed, while the rounding modes described above can still be achieved with relatively simple multiplication and addition operations. In any case it is necessary to define the rule how to round numbers that lie exactly on the boundary. The ruby-gem long-decimal supports geometric, harmonic, quadratic and cubic rounding in addition to the regular arithmetic rounding, that is referred to as „half“. Harmonic and geometric rounding are important for some of the mechanisms of rounding with sum. Based on this basis these algorithms will look more natural and no longer like some weird approach that needs to be copied from some untrusted source just to get over the nightmare of having to solve that issue. If you do not know what residue classes are, just read on, it will be explained to the extent needed later on. The concept of rounding seems familiar, but let us try to grab it a little bit more systematically. Usually the number that we are dealing with can be considered to be within the world of real or complex numbers, we can hence assume that , often even or if we are honest . Then we are usually working with , which is kind of implicitly clear. If you do not know complex numbers, just think of real or even rational numbers, which is the most common case anyway. Off course the concepts for rounding of -adic numbers are really interesting and beautiful, but since I do not want to explain -adic numbers here, I will not extend on this issue. What is our intuitive understanding of rounding? that is chosen with certain constraints for each x in such a way that is minimal. This constraint does not work in the mathematical sense (or only with ugly abusive math formulas), but programmatically we can do that: We try and throw an exception if not . which means that contains all numbers of with a maximum of digits after the decimal point. This rounding works quite well with something like LongDecimal in Ruby or BigDecimal in Scala or Java, but BigDecimal offers fewer rounding modes than LongDecimal for Ruby. Now we look at the residue class rounding. We assume such a power of ten . Then we need an integral number and a set of numbers , we call them residues. Now we define . An important application of this is and . This is used in Switzerland and probably other currency regions for rounding money amounts to multiples of 5 Rappen (0.05 CHF). This has already been described in „Rounding of Money Amounts„. If we have and we have the usual non-CHF-rounding case. Maybe there are even cases for and . But the concept is more general, if you like to use it. Most of us know from elementary school how to add multi-digit numbers on paper. Usage of the carry bit is the same concept, but not for base 10, not even for base 2, but for base 256 (in the old 8-bit-days), base 65536 (in the almost as old 16-bit-days), base 4294967296 (32 bit) or base 18446744073709551616 (64 bit), whatever is the word width of the CPU. Always using powers of two is common today, but it is quite possible that this will change from bits to trits (having three possible values, -1, 0 and 1) in the far future. I do not think that application development should be dealing with low level stuff like bits and bytes, but currently common programming languages like Java, C, C++, C# and more would not let you get away with that, you have to be aware of the bits underlying their numeric types to some extent. So it is a good idea to spend some effort on understanding this. Unfortunately all of these languages are lacking the carry bit, but it is anyway useful to understand the concept. I have been writing software since the beginning of the 80es. The computers available to me at that time where 8-bit with a 6502- or 6510-CPU and 1 MHz clock speed. Yes, it was 1 MHz, not 1 GHz. It was possible to program them in some BASIC-dialect, but that was quite useless for many purposes because it was simply too slow. Compiled languages existed, but were too clumsy and too big to be handled properly on those computers, at least the ones that I have seen. So assembly language was the way to go. In later years I have also learned to use the 680×0 assembly language and the 80×86 assembly language, but after the mid 90es that has not happened any more. An 8-bit CPU can add two 8-bit numbers and yield an 8-bit result. For this two variants need to be distinguished, namely signed and unsigned integers. For signed numbers it is common to use 2’s complement. That means that the highest bit encodes the sign. So all numbers from 0 to 127 are positive integers as expected. 127 has the 8-bit representation 01111111. Now it would be tempting to assume that 10000000 stands for the next number, which would be +128, but it does not. Having the highest bit 1 makes this a negative number, so this is -128. Those who are familiar with modular arithmetic should find this easily understandable, it is just a matter of choosing the representatives for the residue classes. But this should not disturb you, if you have no recent experience with modular arithmetic, just accept the fact that 10000000 stands for -128. Further increments of this number make it less negative, so 10000001 stands for -127 and 11111111 for -1. For unsigned numbers, the 8 bits are used to express any number from 0 to 255. For introducing the carry bit let us start with unsigned integral numbers. The possible values of a word are to where is the word width in bits, which would be 8 in our example. Current CPUs have off course 64-bit word width, but that does not change the principle, so we stick with 8-bit to make it more readable. Just use your imagination for getting this to 32, 64, 96 or 128 bits. So now the bit sequence 11111111 stands for 255. Using an assembly language command that is often called ADD or something similar, it is possible to add two such numbers. This addition can typically be performed by the CPU within one or two clock cycles. The sum of two 8-bit numbers is in the range from 0 through 510 (111111110 in binary), which is a little bit too much for one byte. One bit more would be sufficient to express this result. The workaround is to accept the lower 8 bits as the result, but to retain the upper ninth bit, which can be 0 or 1, in the so called carry bit or carry flag. It is possible to query it and use a different program flow depending on it, for example for handling overflows, in case successive operation cannot handle more than 8 bit. But there is also an elegant solution for adding numbers that are several bytes (or several machine words) long. From the second addition onwards a so called ADC („add with carry“) is used. The carry bit is included as third summand. This can create results from 0 to 511 (111111111 in binary). Again we are getting a carry bit. This can be continued until all bytes from both summands have been processed, just using 0 if one summand is shorter than the other one. If the carry bit is not 0, one more addition with both summand 0 and the carry bit has to be performed, yielding a result that is longer than the longer summand. This can off course also be achieved by just assuming 1, but this is really an implementation detail. So it is possible to write a simple long integer addition in assembly language. One of the most painful design mistakes of current programming languages, especially of C is not providing convenient facilities to access the carry bit, so a lot of weird coding is used to work around this when writing a long integer arithmetic. Usually 64-bit arithemetic is used to do 32-bit calculations and the upper 32 bits are used for the carry bit. Actually, it is not that hard to recover the carry bit, but it is anyway a bit annoying. Subtraction of long integers can be done in a quite similar way, using something like SBC („subtract with carry“) or SBB („subtract with borrow“), depending on how the carry bit is interpreted when subtracting. For signed integer special care has to be taken for the highest bit of the highest word of each summand, which is the sign. Often a so called overflow but comes in handy, which allows to recognize if an additional machine word is needed for the result. Within the CPU of current 64 bit hardware it could theoretically be possible to do the 64-bit addition internally bit-wise or byte-wise one step after the other. I do not really know the implementation details of ARM, Intel and AMD, but I assume that much more parallelism is used for performing such operation within one CPU cycle for all 64 bits. It is possible to use algorithms for long integer addition that make use of parallel computations and that can run much faster than what has been described here. They work for the bits and bytes within the CPU, but they can also be used for very long numbers when having a large number of CPUs, most typically in a SIMD fashion that is available on graphics devices misused for doing calculations. I might be willing to write about this, if interest is indicated by readers. It is quite interesting to look how multiplication, division, square roots, cube roots and more are calculated (or approximated). I have a lot of experience with that so it would be possible to write about hat. In short these operations can be done quite easily on modern CPUs, because they have already quite sophisticated multiplication and division functions in the assembly language level, but I have off course been able to write such operations even for 8-bit CPUs lacking multiplication and division commands. Even that I could cover, but that would be more for nostalgic reasons. Again there are much better algorithms than the naïve ones for multiplication of very long integers.